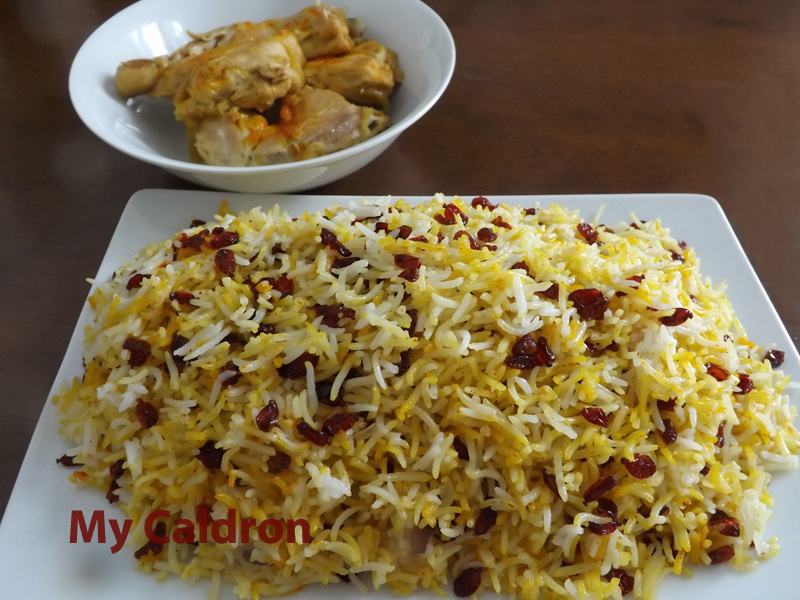 This is one of the easiest yet among the most colorful and appetizing Persian foods which usually finds its way in to big formal parties and gatherings. The two main ingredients – barberries and saffron are relatively expensive, therefore the food is considered prestigious, if simple in making. Ingredients (serving 4-5): Rice (ideally, any type of Basmati), 3 cups. Barberries, 1 ½ cups. Sugar, 2 tbsp. Saffron powder, 2 teaspoons. Salt, 2 tbsp. (this is for soaking the rice). Cooking oil and water. Start with picking over barberries. Sometime you need to be extra careful with solid particles of grit. Place the barberries in a small colander and soak it in a bowl of cold water for an hour. Change the water and repeat the process if necessary. Rinse thoroughly and drain.